On Friday evening I went to the V&A for July’s Friday Late event. The theme was Hack. Make. Create and I went to listen to Martijn van Strien from the Post-Couture Collective talk about his vision for the future of sustainable fashion. The talk was held in a corner of the Fashion gallery, where the lighting was a little moody, so please excuse the rather grainy photos, the Post-Couture Collection website has a far better collection of images of their work. I wanted to write up and share what I learned at the talk because I was impressed by this novel approach to sustainable fashion, and how quickly the initial idea is evolving and maturing. Martijn van Strien trained as a textile designer, learning about how ‘messed up’ the fashion industry is firsthand. After working for a Dutch company that were taking a more ‘traditional’ approach to sustainable fashion (a traceable production line, smaller production runs etc), he was inspired by the Maker Movement to imagine how the fashion industry could create less waste if production was moved from large-scale specialised factories to small-scale, local facilities that can be used to create a variety of products. These facilities would contain laser cutters and 3-D printers, and like the ‘hack-spaces’ that are popping up in various cities, would work on an open-source model. To eliminate over-production, exploitation and waste in the fashion industry, the Post-Couture Collective’s clothes are designed to only be produced as required. The consumer buys the pattern as a digital file for a small fee (van Strien was enthusiastic about the open-source model but doesn’t believe that everything should be free - “I need to eat!” he explained, and €5 for a dress pattern doesn’t seem extortionate), they can then adapt the pattern to their own measurements using Illustrator or similar software, before buying their fabric and heading to their nearest Maker Space to have their garment laser cut. The garment is then assembled with no need for a sewing machine or other tools, using the ‘connectors’ - a series of barbed tabs and slits along the seams of each garment piece. Van Strien was quick to point out that he trained as a textile designer, not a fashion designer, and that his first collection of six pieces used simple, ‘archetypal’ shapes and straight seam lines as his main concern was developing and perfecting the connectors that formed the assembly method of the garment; the crucial aspect of this radical new approach to garment manufacture. The first collection was made from ‘Spacer’ fabric, a knitted, breathable fabric made from post-consumer plastic waste. Although usually a fan of monochrome, van Strien included a pale green in his collection as the fabric’s unusual colour was a result of being made from Sprite bottles! The connectors add a simple but interesting visual element to t-shirts and shift dresses. He acknowledged the limitations to this production method: customers needed a good working knowledge of the appropriate software to really be able to customise the design to their exact requirements, as well as access to a laser cutter. He had a bold vision for the future of the Post-Couture Collective: a ‘Maker Shop’ where customers could select their design, have it digitally altered to their exact requirements on-site, choose their fabric and have the garment pieces cut for them using the in-house laser cutters, all within the space of around half an hour. The customer would then take away their garment-assembly kit, which should take a further half an hour to make up. Hopefully, this process would be quick enough to satisfy customers desperate for a fashion fix, but seeing each part of the process, and being responsible for a key element of it, would encourage consumers to value and take care of their garments. Van Strien also emphasised the limitations of the designs in his first collection and how he was improving his design process. As well as inviting feedback and constructive criticism from customers, he has worked with recent fashion design graduates who have challenged him to develop the technology to produce more complex pattern pieces. For him, the advantage of open source design is that development happens faster as more people experiment with and improve on designs. He is also interested in improving accessibility for people without the requisite software knowledge, and jokingly put out a call for programmers to work alongside him in creating more user-friendly pattern-drafting software! As with any technology still in its infancy, basic prototypes often seem a long way off challenging traditional methods of production or consumption. The first collection was interesting, the simple shapes reminiscent of Pierre Cardin’s or Andre Courreges’ 1960s space-race- inspired collections, but the sort of thing a fashion or technology nerd might buy as a novelty, not something that would become a wardrobe staple. What impressed me was the huge leap forward in style and wearability shown in the second collection; these were pieces that were futuristic but in a wearable, sophisticated way, not in a kitschy, sci-fi costume way. Don’t get me wrong, I love a kitschy sci-fi costume, but the only thing that is going to make sustainable fashion innovations take off is if people can imagine wearing them right now, and I can definitely see pieces from the Post-Couture Antwerp Collection finding a home in my wardrobe. I won’t be giving up my sewing machine just yet, but I might just be looking for a hack-space with a laser cutter in my neck of the woods! 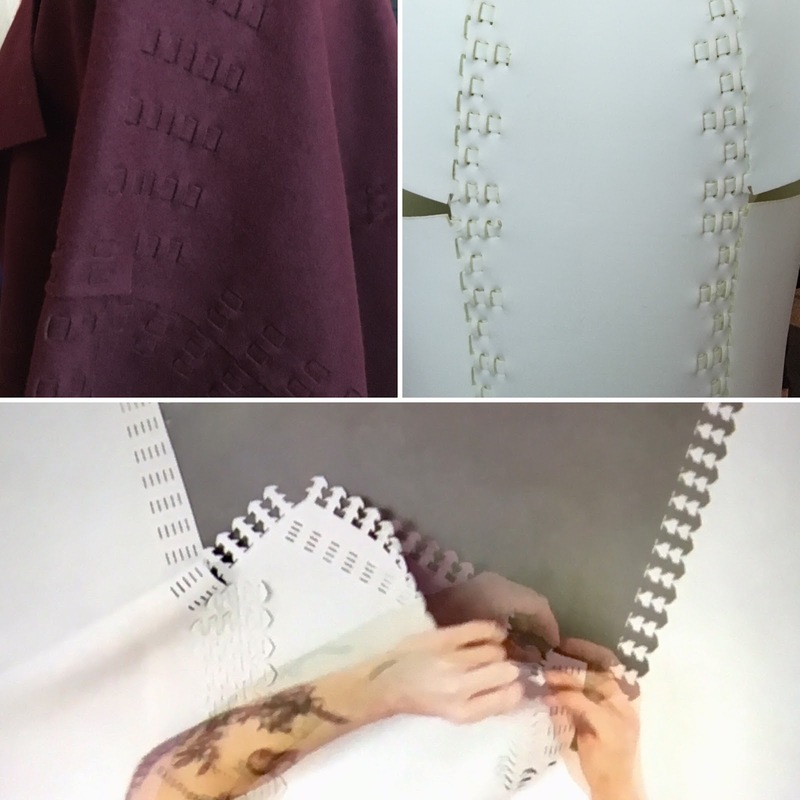 This is fascinating - a girl at my uni, but a couple of years above me, did a similar thing design wise for her final collection (a little googling and I've tracked her down - Nicola Morgan http://www.nicola-morgan.co.uk/index.php?/collections/alterpretations--2009/). I fear the input from the consumer means it's probably not the future for fashion, not entirely, but the co-op spirit and local making I do hope becomes a more popular thing! Thanks for your comment, I'll definitely check out the link! I'd like to hope that people start to see the contents of their wardrobe as something they can become more actively involved with, but it's definitely going to take some time, it'll be an uphill struggle against the immediacy and short-term convenience of fast fashion!